In a damp area beneath the arches of London Bridge until September 17th lurks something quite unexpected – a real theatrical treat set in smalltown Georgia. 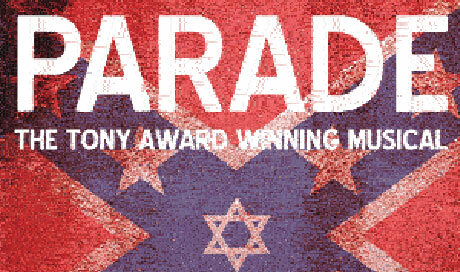 Parade is an irresistible musical – having listened to the soundtrack hundreds of times, from the initial drumbeat of the opening song ‘The Old Red Hills of Home’ I tend to develop goosebumps in anticipation. The combination of Jason Robert Brown’s fantastic composition and Alfred Uhry’s book, based upon a true story of the murder trial of Leo Frank, it can hardly be beaten for quality and sheer immersiveness. It’s a simple formula of a gripping tale, accessorised with period detail and prejudices and expressed through a wonderful soundtrack. This production has used promenade staging with audiences on either side of a central ‘catwalk’, plunging the viewers right into the centre of the action. The choreography is second to none, capturing the frenzy and anger of the local community in reaction to the central tragedy – the momentum generated is immense and the result visually spectacular. The characterisation here is important, and the focus on the central relationship of Leo and his wife Lucille is not neglected – a great performance from Laura Pitt-Pulford captures this strong, frustrated and capable heroine’s struggle as her awkward husband is accused of a dreadful crime. Another outstanding performance comes from Terry Doe as Jim Conley, who captures this slippery character to perfection. This is a great chance to catch a classic of modern musical theatre, and is a steal at the price – the Southwark Playhouse operates ‘airline-style’ pricing which means the earlier you book, the cheaper your ticket. The maximum price is £22.50. One tip would be to take along something to sit on as the seating can be slightly uncomfortable… That was really the only drawback of a truly great evening though, so well worth a visit.